When I went to Trader Joe’s in La Jolla, I saw the fruit stand nearby with their colorful display of fruits and vegetables and could not resist the gorgeous red pomegranates. I got a bonsai pomegranate tree as a kid and was fascinated with the pinky sized pomegranates hanging from it at the beginning of October. Eventually I got tired of not being able to eat them and asked my dad to plant the tree in the yard. After years of my dad’s hard work, the tree has grown to four feet and consistently produced a few fruits every October to November. 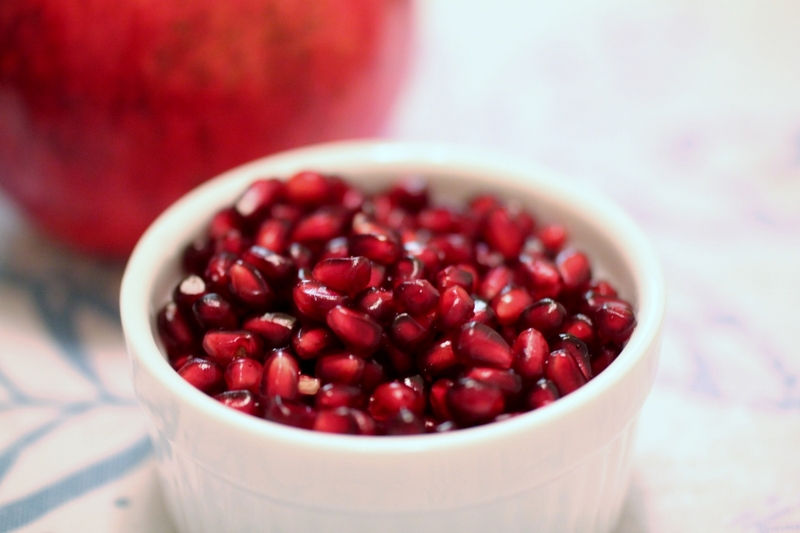 Pomegranates take a lot of work to extract the flavorful, crunch, juicy seeds, but they are absolutely delightful once you taste them. 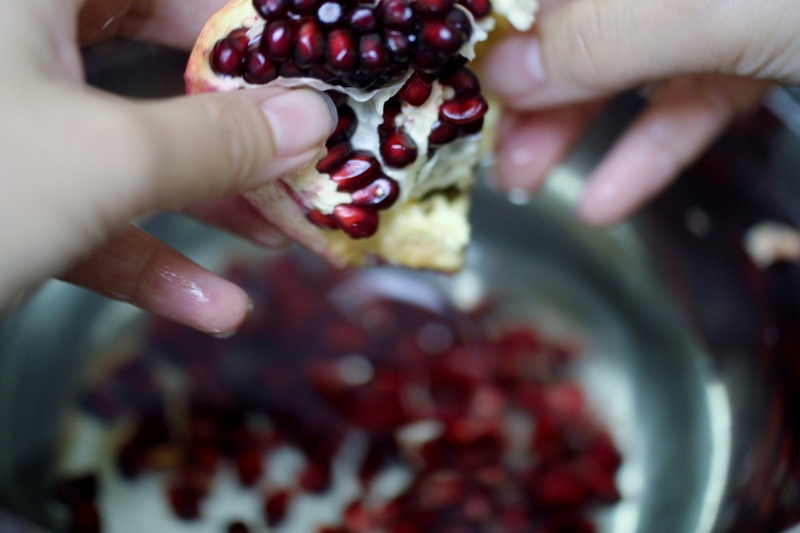 The ripest pomegranates are deep red and their peels begin to crack open. I love the color of the seeds, like precious tiny rubies. 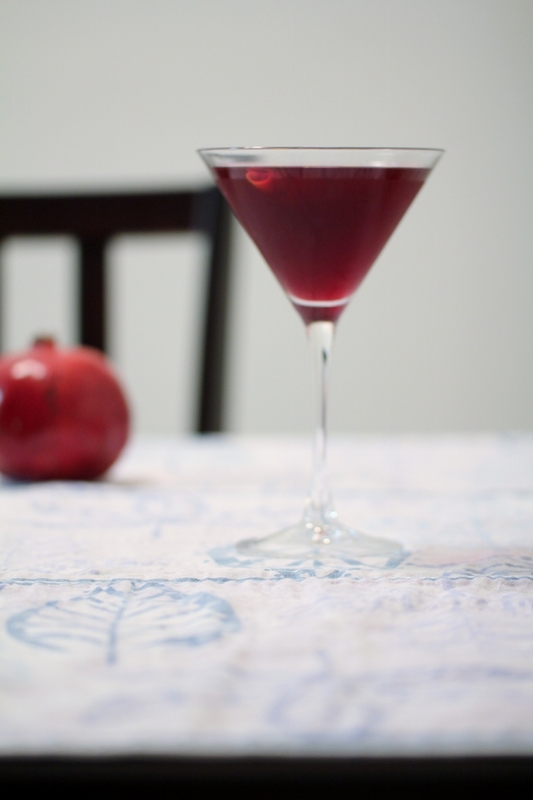 This time, I wanted to try something different and make a pomegranate martini instead. If you like cranberry vodka, a pleasant surprise awaits you. 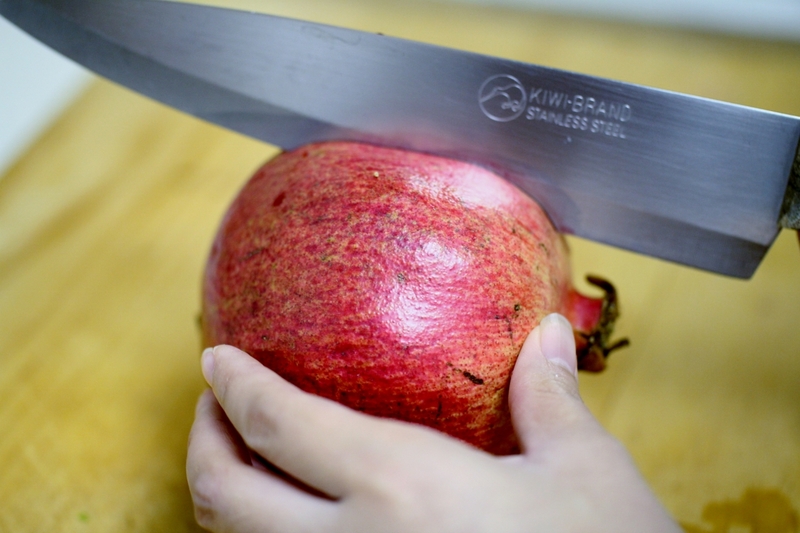 With a knife cut the pomegranate in half. Use your fingers to pry the fruit apart. Working over a bowl filled with water, pry the seeds away from the membrane and peel. Once you are done stripping the seeds from the peel and membrane, strain the seeds from the water. 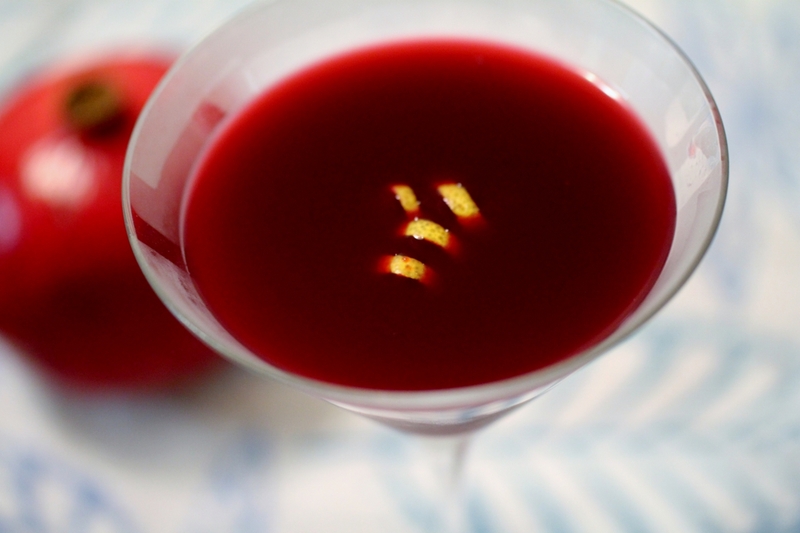 You can use half for your martini and save the other half to munch on. 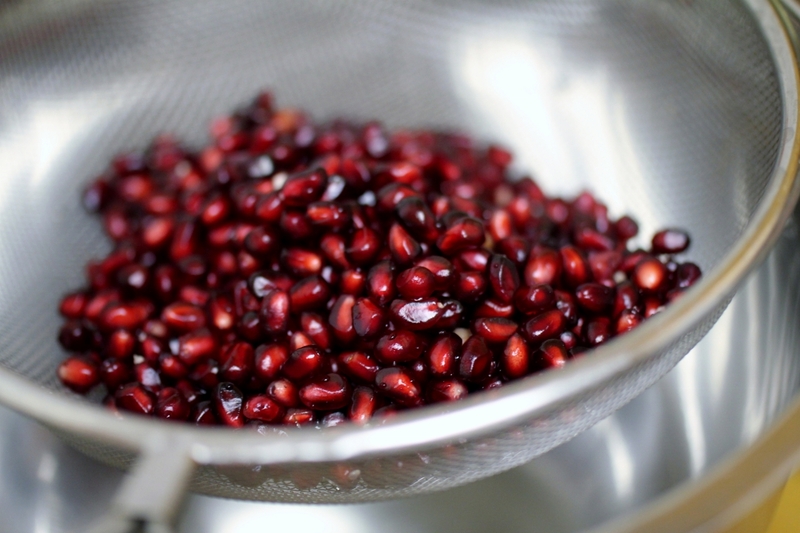 A large pomegranate can make up to two cups of juice. If you are busy, you can always skip all this work and substitute with POM from any grocery stores. 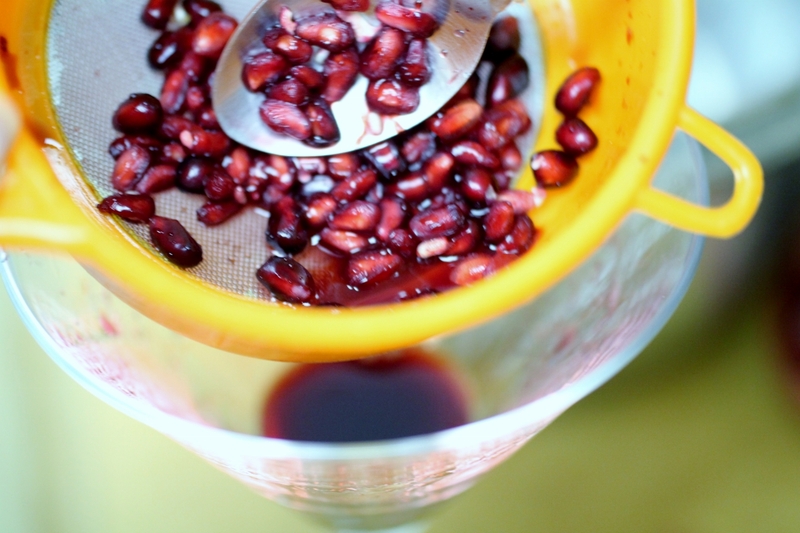 Press the seeds through a sieve to extract the juice. Add the sugar to the juice and mix well. Pomegranate juice can be a bit tart so add enough sugar to you liking. To a martini shaker add the vodka, pomegranate juice, and a few cubes of ice. Shake and serve in a chilled martini glass.